The March Nintendo Direct has been and gone, and it's left us with some huge new announcements, including a ton of new details for Mario Tennis Aces and a confirmation it's coming this summer on 22nd June. So what's new in the world of Nintendo-related court-side action? There are 15 playable characters to choose from, each with their own unique abilities (including, we might add, actual Chain Chomp), and the option for four-player local multiplayer and online support. You'll also be able to use the Joy-Con's motion controls for some Wii Tennis-style slices and lobs. Rackets can break (Breath Of The Wild-style) if you're not careful, but there are lots of special abilities to keep you in the arcade action. You can hit amazing Trick Shots when you're on offence, or hit Zone Speed to slow things down so you can hit a shot that should be out of reach. There's even a Special Shot for hitting over-the-top aces or smashing your opponent's racket to bits. If you're a purist, there's also a mode that strips out all these crazy moves, so you can enjoy a 'sim' experience if that's your thing. Add in participation bonuses for online play and you've got one impressive little tennis-themed package. Oh, and there's a pre-launch online tournament due before the summer, so watch out for that. Can't wait! 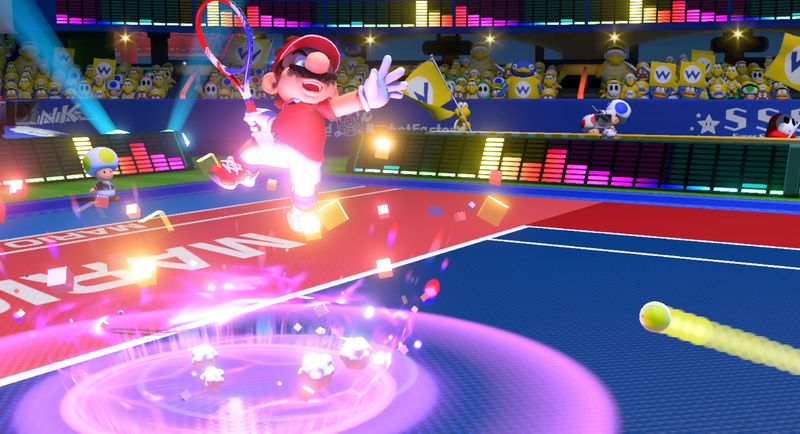 Yes, the last Mario Tennis was a bust but it looks like this one will be more fully featured, like some of the Mario sports games I grew up playing. I put countless hours in Mario Golf and Tennis on 64 as a kid and as an adult I put well over 200 hours into Mario Golf on 3ds. I really hope this lives up the my expectations because when done right, these games can be so much fun! The leaks of 22nd June as the release date were true. There was the Japan Rakuten leak today which was quickly pulled but Amazon Spain had previously revealed the date last month. Wait chain chomp is playable? If so I found my main! Finally, Wii Sports for the Switch. @Radbot42 watch the video if you haven’t, the Chomp with a racket in its mouth is hilarious/awesome/hilariously awesome! "This lives or dies on its story/career mode for me"
Same here. Put countless hours into Virtua Tennis on the Vita and this could be great....though from what I've seen so far I doubt it will be. I’m interested. I’m tired of tennis games ending up feeling same-y (there’s been so many by now) and the new mechanics seem to add a fresh layer of strategy without just relying on chaotic RNG. Also there was an awesome clip of Waluigi in the video! And yet probably no Kamek. I have to say this game impressed me. Not only are we getting a full blown story mode, but it appears they removed the chance shots and added a lot of on the fly decision making with the power gauge. Should make the game interesting as long as nothing is too overpowered. The characters, courts, and presentation look great, too. Especially since it appears to all run at 60fps. And of course having Chain Chomp as a playable character is amazing. I'm looking forward to this! Seems I'm the only one who wasn't impressed at all by this? These new gimmicks look like trash IMO. I loved the Power Shots in Mario Power Tennis, but this... no. I really want to love Mario Tennis again but they're making it incredibly difficult. Here's hoping I just don't like it from the trailer's perspective and that I'll make a 180 once I actually play it. Hopefully this has a story mode, also would like to see a new Mario Baseball and Golf game for the Switch. I wasn’t too excited for this when it was announced but after watching the direct, I’m definetely looking forward to it. Looks like a lot of fun! Not so sure on the broken racket mechanic tho but everything else looks like everything that Mario Tennis Ultra Smash could've been. Thank goodness for the "normal play" option! The whole "you can break your racket" gives me the unnerving feeling that Nintendo got the wrong message from Breath Of The Wild's GOTY award. Mine has bent a teeny little bit so yeah. Hopefully durability won't be mistaken as a game changer, because it is, but for the worst if not drip-fed. I hope we get more diverse characters in this. Chain Chomp is a start,but there's so many Mario characters that can fit right in. Will there be new Amiibos for this game? I think I'll pass. The single mode seems more like a mission mode than an RPG mode, which was the bread and butter of the Mario sports games for me. Looks good, but I know I'll be bored in a couple of hours with it. very, very good, well, only to wait and buy day one!! Mario Golf next please! Was skipped on Wii U! Mario Baseball wouldn’t be a bad idea either! They made this look really good. I'm a lot more interested than I was before. Not gonna lie, the idea of playing as a chain chomp is like 50% of why I am now thinking of buying this game. Looks great. Lots of neat gameplay elements. Hopefully it'll be a bit better than their last tennis effort. ...but the Simple version and motion control won me back. Just. @1UP_MARIO The evidence is pointing toward Smash being SMA5H instead of a SM4SH port. This looks every bit the game Ultra Smash should've been, and some much needed additional gameplay elements to freshen up the formula. Blatant Ultra Smash copy (+ 3 more 'tricks' and tournament mode). So weird not to tell us a bit more about single player content.. I fear the worst. The only Mario Tennis I've ever gotten into was the one on Wii, because the motion controls were just so fun to play and it was such a perfect fit for the game. I knew they would add motion controls for this and they did not let me down! Those trick shots and zone shots aiming in slomo with the joycons, racket durability, specials, local co-op and full MP, single player story mode and online tournaments, classic play, crazy characters like Chain Chomp? Holy moly gimme gimme gimme! And bring some Mario Golf next, please! There was a lot more "new" than just Mario Tennis. That was a hard sell! Feel a little violated but yeah. Day one. @JaxonH: The Wii entry was a motion-controls added-on version of Power Tennis for the (Game)Cube. Just letting you know. @Everyone_Else: If this game turns out to be an excellent multiplayer game, at least one way, or both(local/online), then I suppose it could very well become an evergreen title, or near to it. What matters is how fun it is. The single-player mode can only add to this, especially if it's an rpg make/build-your-own-character. I didn't know that, actually. I never really played any of the other entries because they never really interested me. But hey, it seems the motion controls were all that was needed to make it a must-have game. Just like Pikmin 1 and 2 with their New Play Control Wii entries. Couldn't really stand playing them on GameCube because the analog controls just... weren't that good. But once you could aim via motion? Masterpieces. Both of them. And Pikmin 3 took that concept and integrated it into the core game. Immaculate masterpiece, that one. I'm impressed, this game actually sounds REALLY GOOD! I'm looking forward to it. @JaxonH: Also, unlike their N64/GBC predecessors, Power Tennis, & the GBA Advance Tour did not have the connectivity that the N64/GBC entries had. The N64/GBC Mario Tennis/Golf games had connectivity via the N64 Transfer Pak. Motion controls do quite a lot of awesome, under the right conditions. Just a few days ago I was playing Star Wars: The Force Unleashed on my WU's Wii mode. I kinda forgot how fun motion controls can sometimes be. This new entry gave me a lot of Mario Power Tennis vibes, which is a game I have a lot of fond memories of playing with my brother. It's honestly more exciting to me than Smash. I absolutely love all this! Can not wait to take the game with me this Summer vacation! Preordering this and definitely playing online tournaments. Love Mario Sports titles cause of the unique twists / items that shake up the gameplay. The whole trick shot meter mechanic has me totally on board. All i want is Pauline and Shy Guy in this. Nothing else matters. Okay... this game looks WAY deeper than I thought. Seeing a Chain Chomp playing tennis is the hilarious. Guess I found my main. Looks great. Haven’t played a Mario sport game in years(maybe decades) so I am really looking forward to this. Looking forward to this one. I think I'd have to put myself in the purist camp so it's nice to know there's the option to switch off all the madness and special moves if and when you need too. Although no doubt I'll have a blast with both. And mine is on 19th June, which is also before the release date. Karabast! I'm undecided if I like the new gimmicks in this or not. But I am with you with the Power Shots in Mario Power Tennis, I've had many fun times playing against my friends with some close matches and some well timed Power Shots. 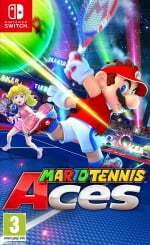 I've enjoyed all the Mario Tennis games (even Ultra Smash to a degree) and this one looks like it could do really well and luckily there is the option to have it off in the Simple Rules Mode but I don't really want to buy this just to spend most of my time in Simple Rules if I don't like the gimmicks and have to be forced to use them in the story and (hopefully) other game modes like in Mario Power Tennis! @DToad64 I mean, even if you play with simple rules, you know you're going to be forced into the gimmick stuff anyway if you want to go through story mode. Very late! So that means the only new Switch game this first half year is Kirby, wich doesn't look super-hot. Yeah fair point, I will need to try it out before I can say for certain but I just hope there is more mini-games like in Power Tennis though. I would also like to try the online and see how competitive people will be with using it or not, hopefully there will be an online Simple Mode as well for those not keen but I can see that not happening.